Its time again for Lucky Lucille's Sew For Victory sew-along. I love sharing my projects and seeing what others come up with too. I always seem to run late on sew-alongs but this time, I'm picking something really simple. My wardrobe is in desperate need of more jeans. With mom living in the country now and a garden to plant in a few months, I must have jeans and overalls for working outdoors and fishing. Last year I sewed a pair of overalls and jeans from the Wearing History pattern and I love them so much, I think I'll crank out a few more pairs. 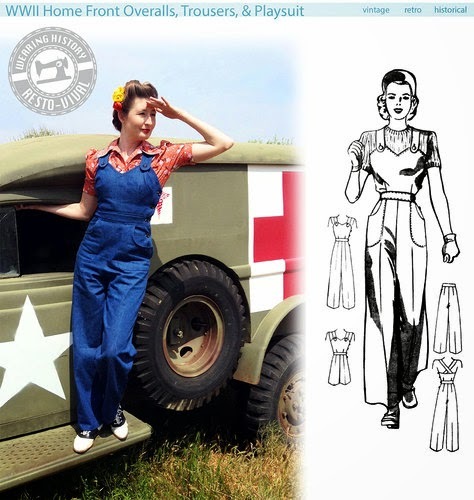 I have always wanted to buy some of those fab repro jeans but for the cost of one, I can make 2 or 3 pairs myself! 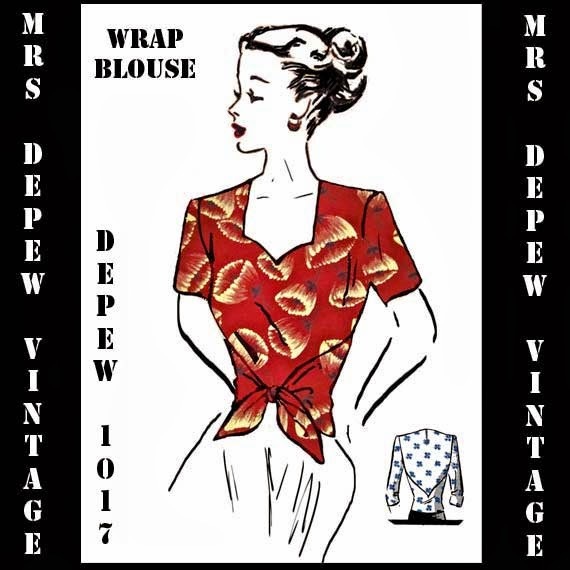 To complete my jeans outfit, I'm sewing Mrs Depew's 1940s wrap blouse. I sewed two of these for Daffny from A Vintage Nerd a few years ago- one in cotton and one in a stretchy tee shirt material. This one so cute and quick to put together and I love anything with a sweetheart neckline. I can pair these blouses with my jeans, overalls or a skirt this summer. I'm undecided on fabric for this one. I really loved the way Daffny's tee shirt blouse turned out so I may sew one or two of those. Wonderful project choices! I've been wearing (repro) jeans more in the last year than I probably have since I was a teenager, thanks to our darling pup (and her bevy of friends at the dog park), whose rambunctious nature does not partner well with more delicate garments (thankfully, she's only torn one vintage dress so far and it wasn't a major tear), so if I was taking part in this great challenge, jeans or another really sturdy sort of pants (like cords) would likely be my first choice, too. These are fabulous projects! 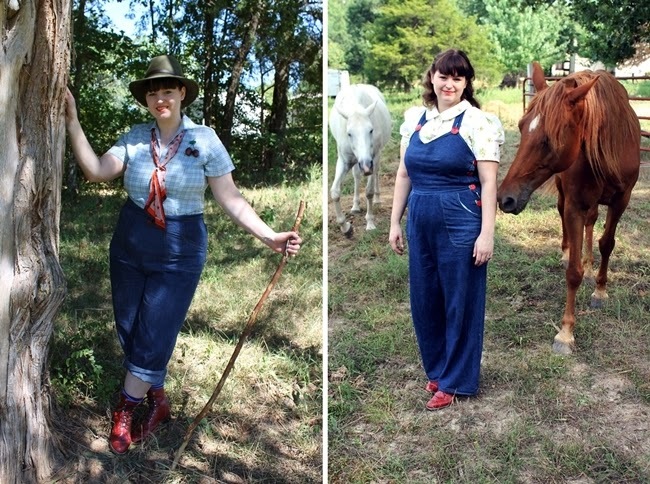 I've been dying to try those overalls/jeans myself! They look so adorable and I can totally see gardening and rambling about in them. Britanny Hello, nice to meet you my name is Cristina's blog Retro Mix Cris'm 35, I live in a town in the interior of southern Brazil. I am also a mother and housewife who loves the vintage style. I hope we can meet us and and be great friends. About your post, I loved the idea of the suit and shirt. Very handy for gardening. Come to know me and follow my blog too. Sorry my english is not very good. Use the google translator. A big hug, Cris.